Well I am up to 3 pattern repeats on my Soft and Lacy socks. They are coming along fine, the pattern is perfectly manageable so far, but, there was a problem. There is no way I can commit this 20 row chart to my memory, even vaguely, so I have to knit them with the big light on and properly concentrate on the chart! So on Saturday, yes I know only 3 days in, I decided that I had to cast on a new pair of socks that would be conducive to knitting in front of the TV, with a dim lamp and not mind being picked up and put down. So the pattern searching began. I recently ‘had’ to buy this lovely ball of yarn and thought the colours and striped effect would work perfectly with Scylla a pattern I only found out about because of this KAL. So I cast on on Saturday and on Wednesday I turned the heels, my progress being helped by a power cut which meant I couldn’t really do anything but knit, yes, I could have probably done housework or paperwork but incredibly knitting seemed more attractive ;) I’m really enjoying the pattern, its easy to see where you are, the stitch pattern is simple to memorise and it looks so effective on self striping yarn! Perfect! Remember in my last KAL post I told you I got some new needles? I had an impulse buy after seeing them on another knitalongers Instagram feed! Well, I love them! They are ChiaGoo needles (I got them from here) and they are such a pleasure to knit with. I usually use Addi Lace needles for magic looping socks and really like those too but I’m enjoying knitting with the ChiaGoo’s a lot more. 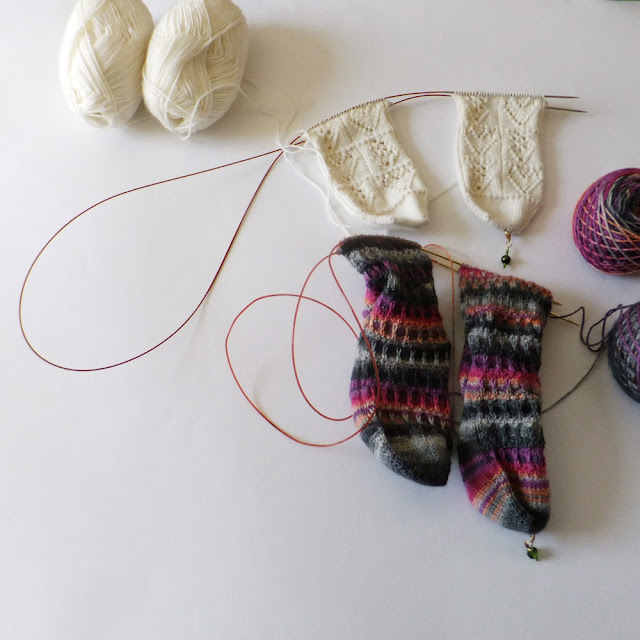 The lacy socks are on the ChiaGoo’s and the stripey ones are on the Addi Lace. The ChiaGoo cable is memory free which means I don’t get into tangles and the join between the cable and the needle is super smooth. See the Addi Lace cable has a bit of a mind of its own! Socks are definitely my current obsession and I am loving watching everyones progress. Check out Sarah's post and all the blog links of the other knitalongers here. 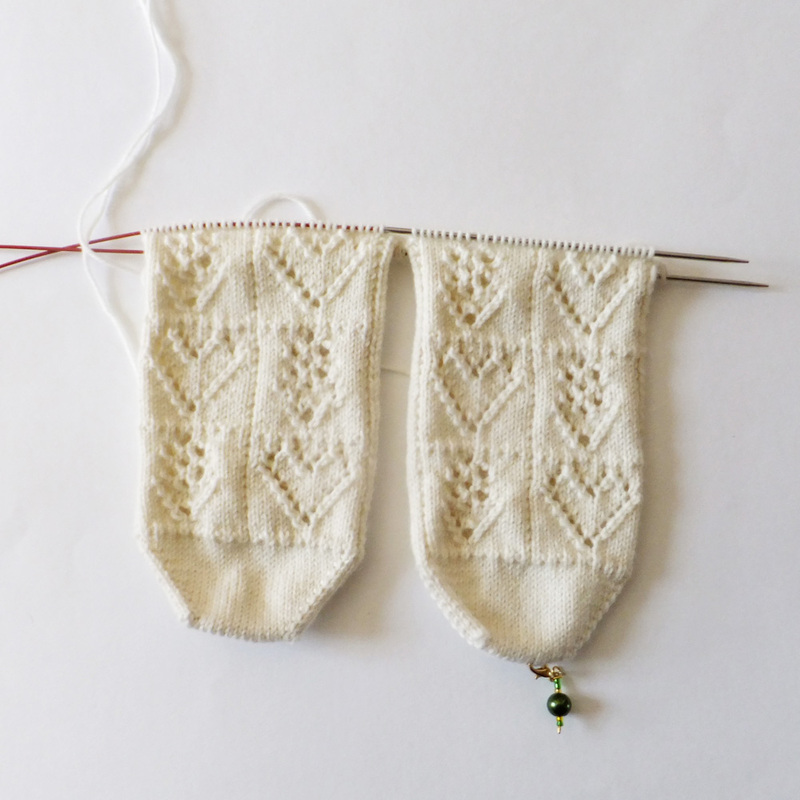 Do you like knitting socks? What patterns are your favourite? Oooh, both pairs are gorgeous :) I knit my 2 at a time socks on Chiagoos too, they're really nice to knit with, aren't they! Thank you :) Yes they are definitely my new faves! Both pairs are lovely, but the white ones are very pretty indeed. I havent' knitted socks in ages, except for the sokeyrings I make. I always find they never fit into any shoe comfortably, but I do like hand knitted socks. Oh yes those little keyrings are so cute! 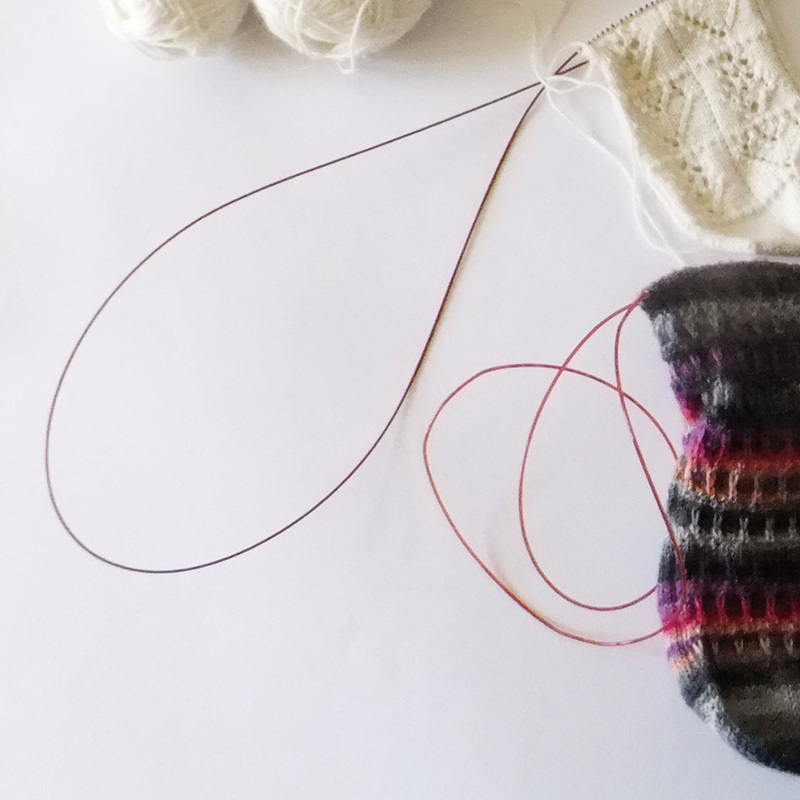 Love the lace socks but can see how they are a pattern for concentrating on and sometimes you just need something to knit while watching tv or that you can take up and put down. Yes, I love making socks but this is the first time I'm making two at a time and toe-ups. I've only just started the 2 at a time toe up kind, I cant believe I was scared of it for so long, its a great way to do it isn't it! 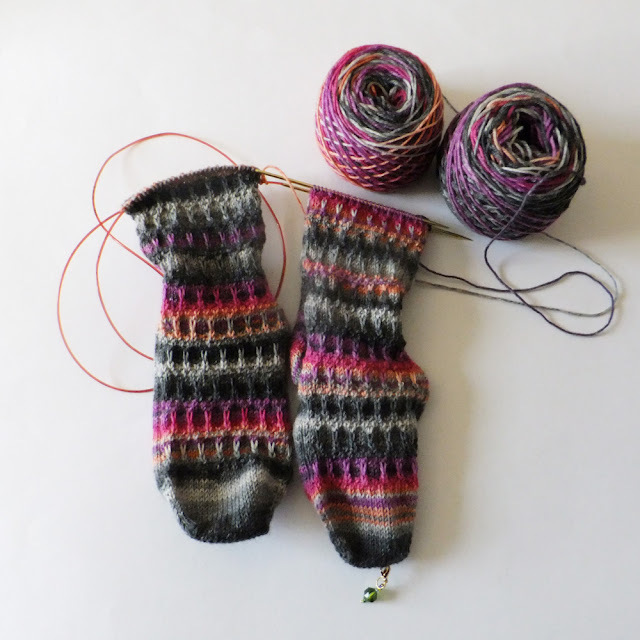 You've not only made one but two stunning pairs of socks.....I'm super jealous! I love the second pair they go perfectly with the yarn. Like the sound of those needles, I have one circ. That I like to use and needless to say it is the wrong size for my current socks so I am dealing with Curly flex bits.....I'll check out those ones. I would definitely recommend the needles, I was unsure about them at first as they do feel a little different but they are worth persevering with! Both pairs look fantastic! I like the delicate lace pattern of the first pair (don't blame you on not being able to memorize it) and I love the colors of the second pair. Great job! I love both pairs of socks but I have to say that new pair are AWESOME - I love the colours. I've done exactly the same as you - I usually use Addi Lace and am making a pair on ChiaoGoos and also having a similar feeling about them. I was tempted to order the full set of interchangeables but still not sure about how the join might affect what I love so much about this one.